In June, I sat in the crowded lobby of the San Jose Marriott hotel just across from the convention center where WWDC was being held. The lobby was crammed full of developers and other people tapping away on Macs and iOS devices connected to the hotel’s WiFi. I sat down with the Astro HQ team for a demonstration of an upcoming hardware product called the Luna Display, a tiny dongle that turns an iPad into a wireless second display for a Mac. Hotel WiFi is notoriously bad and the Marriott’s, which was ambushed by thousands of WWDC attendees, was holding up, but spotty. The Astro HQ team pulled out a tiny nubbin and connected it to a MacBook Pro’s USB-C port. After starting the Luna Display software on the Mac and an iPad, they were up and running with the iPad acting as a second display. Despite the shaky connection, the iPad performed admirably. It felt like magic. Yesterday, Astro HQ launched a Kickstarter campaign to raise $30,000 to make the Luna Display, which it exceeded almost immediately. The Luna Display comes in two varieties that connect via USB-C or Mini DisplayPort. The part that sticks out from the side of your MacBook is about the size of a fingernail, though the hardware I used doesn’t include the exterior shell around the chips, which looks like it will make the device slightly larger judging from the pictures on Kickstarter. Setup is simple. 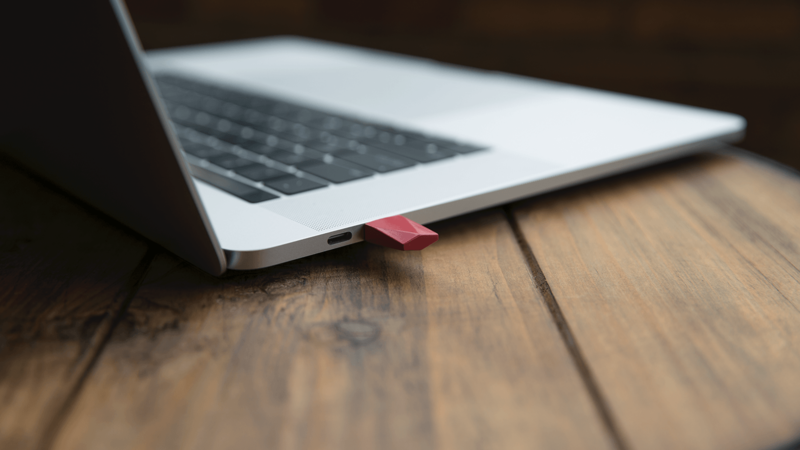 Plug the Luna Display dongle into your Mac and launch apps on your Mac and iPad. After a few seconds, the iPad is working as a second display. You can also enable HiDPI-mode that takes advantage of your iPad’s Retina display by installing an extension on your Mac, which should be perfect for artists who want to use their iPads as high resolution drawing tablets. Connecting the iPad via USB is also possible if you don’t have a WiFi connection or want the best-performing connection possible. I’ve been using the USB-C version of the Luna Display with my 2016 MacBook Pro and 1st generation 12.9 inch iPad Pro for a couple of weeks and have been impressed with its performance. When used over WiFi, the Luna Display is not as fast as a wired display, but it’s close. The only time I notice a difference is when I scroll quickly through something like a web page in Safari. The text and images drop to a lower resolution while the window is scrolling, but everything comes back into focus almost immediately when the page comes to rest. Putting the Luna Display in HiDPI mode helps considerably, but the effect is still noticeable. That said, I don’t view this as a major drawback because I can’t imagine there are many scenarios where it would have a meaningfully impact on how most people use the device. When connected, the Luna Display works like any second display you attach to a Mac, except your second display is fully touch-enabled because it’s an iPad. 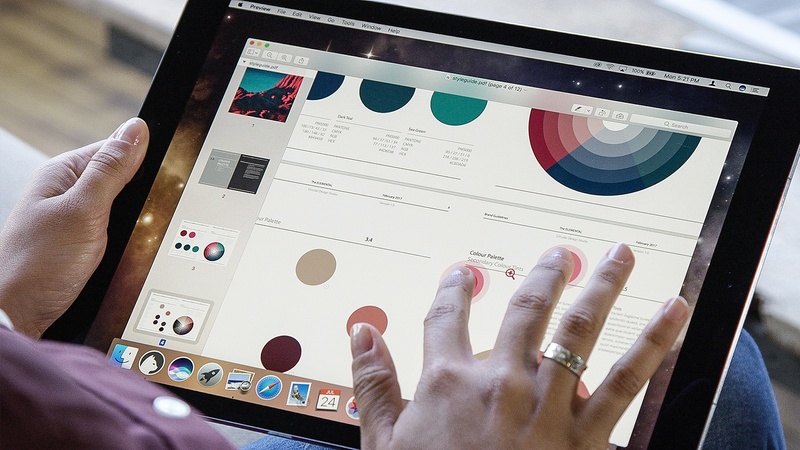 Your finger or Apple Pencil becomes the mouse pointer allowing you to select menu items and do anything else you could with a mouse. Of course, macOS is not designed for touch so the interactions can be awkward at times, but they work. Trackpad gestures like two-finger swipes to scroll and pinching to zoom in and out are also supported. If you have a keyboard connected to your iPad or any input device connected to your Mac, you can use any those for input too. The Luna Display app, which is still in beta, has crashed on my Mac a few times disconnecting my iPad. The Luna Display depends on the carefully choreographed coordination between hardware and two apps, so the fact that there are still some bugs is not surprising. It’s also worth noting that your Mac’s sound is not transmitted to your iPad either, so don’t expect to hear audio playing if you’re using your iPad as a second display in another room.1 That said, it’s important to note that I’ve been using preproduction hardware and software, so this is not a review; these are my first impressions only. Your mileage with the final shipping version of the Luna Display will undoubtedly vary. I’m sitting in bed writing this, two floors above my basement office where the Luna Display dongle is running on my MacBook. I could switch to Ulysses for iOS, but for now, I’m writing in Ulysses for macOS simply because I can. That’s not the best use case for the Luna Display because I can easily switch to the iOS version of the app. I’m fortunate that most of the work I do can be done equally well with iOS apps, but if you use a macOS-only app, Luna Display is an excellent way to untether yourself from your Mac. Artists doing creative work in apps like Photoshop should appreciate Luna Display too, especially when combined with Astro HQ’s Astropad app. What Astro HQ has pulled off is remarkable. 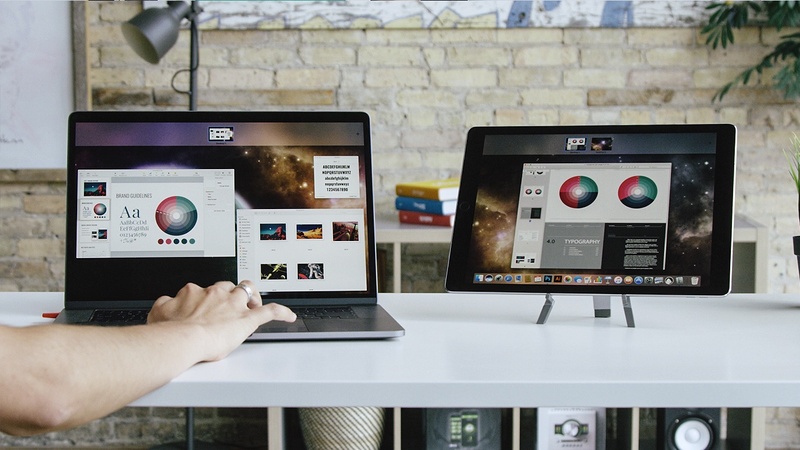 Through hardware acceleration, the team has created a solid wireless second-screen experience on an iPad for Macs. It’s not something that everyone will have a use for, but judging from the early results of the Kickstarter campaign, it looks like Luna Display has struck a chord. If you like to run a second display when you work or just want a way to get away from your desk and still work on your Mac apps, check out Luna Display, which Astro HQ estimates will ship next May.